EVOD VV 1600mah battery from Kanger is variable voltage lithium ion twist battery that boasts lasting power and strength. It is a Mega 1600mAh e cigarette battery that will give you up to 2-4 days of vaping between charges. It is sleek and shiny and made of high-quality stainless steel. This battery is also available in black, cherry, brown and blue. 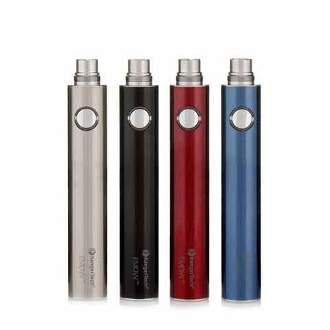 The variable voltage feature that this battery has allows you to adjust the voltage you use when vaping. This gives you much more control of your vaping experience. The voltage range of this great battery is 3.2v to 4.8v. The twist dial located at the bottom of the battery is all you need to make any adjustments. Some tanks and clearomizers operate at a higher level and voltages that are not the normal 3.7v. Along with the tanks, different thickness's of e-liquids also are more effectively vaped at different voltages. For instance; thicker e-liquids are better used with a higher voltage battery, and thinner liquids will work better with lower voltage batteries. The EVOD VV 1600mah Battery is a sturdy, yet classy choice for anyone looking for a powerful, satisfying vaping experience and comes in stainless steel. The initial charge should be for 8 hours. After that, all additional charges should be for no more than 4 hours at a time.